Know what’s working and why. We track it all for you. One of the greatest advantages of digital marketing is our ability to track virtually everything, which results in optimal use of your marketing budget. We’ll establish tracking mechanisms on every platform that we’re utilizing to promote your business, so we’ll know exactly what’s working, and what needs changing. Every Slamdot digital marketing client has access to a wealth of reports and key metrics to measure your return on your investment. You’ll be emailed a regular report that your account manager will discuss with you, and you’ll also have access to view data in real time. Our team is on site and available for monthly recap meetings to discuss your campaign in person. You’ll have access to software that lets you view your campaign performance, social engagement, and website analytics live. We can track phone calls back to which campaign, keyword, or strategy triggered the call. If you like, we can even record them. We’ll monitor your search ranking across several major search engines for each keyword that’s important to your success. We can record the screens and mouse movements of people using your website, and see exactly what they did. 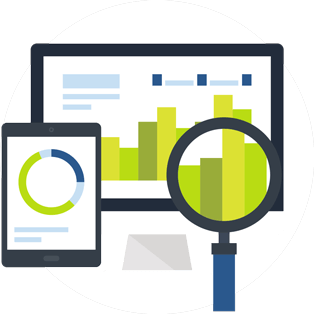 We can integrate data from multiple systems and sources into advanced reports that give you more insights into your business. Contact us at (865) 238-5600 or drop us an email for more information about our reporting and data services.